…I’m cultivating it gently… I don’t want to go all out and mega haul, I’m dipping my toe 1 product at a time. eBay, QVC, my mother’s makeup collection… nowhere is safe. I’m loving your baked goodness! I’m the happy owner of the above 3 Laura Geller eye products. 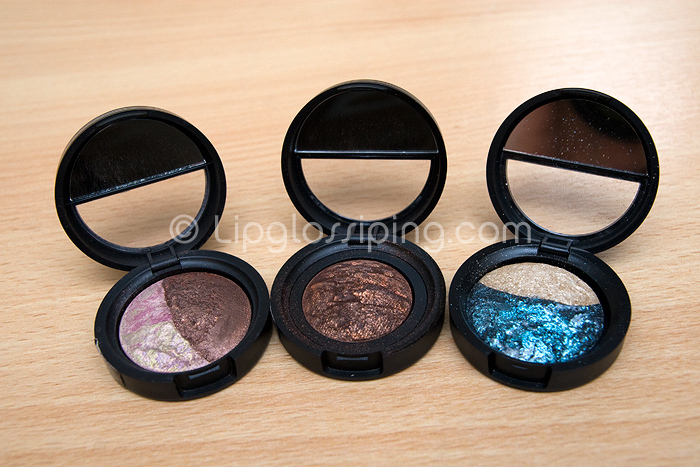 L-R: Pink Icing/Devil’s Food Duo, Bewitching Bronze, Eye Rimz Fire Water. Out of the three, the pink icing duo is my favourite… it’s the most beautiful combo for a neutral eye. Bewitching Bronze is lovely too but I’m slightly disappointed with the Eye Rimz, as it’s mostly glitter that doesn’t stick too well either as a shadow or a liner. It’s a gorgeous colour though. All Laura Geller baked shadows can be used wet or dry, so they’re pretty darn versatile. Laura Geller are a brand I don’t hear too much about. The fact that it’s stocked exclusively by QVC in the UK may have something to do with it, rendering it fairly inaccessible. I’m looking forward to continuing my exploration into the brand. Are you a Laura Geller fan? Anything I *must* try? I saw these on QVC ageeeeeeeeeeeeeees ago when I was waiting for the Bobbi Brown hour to start and in all honesty, they looked really nice in the containers but when the lady applied them, they looked really cheap and tacky. I think it was her blending skills more than anything. The blushers are beautiful. I have a gorgeous Blush n Brighten in Golden Apricot that just makes me look healthy instantly. So lovely. Want more! Hmm, I have some Laura Geller and have used the Balance and Brighten a few times. I even have her Spackle primer too. Not sure I’m overly in love, but I don’t think I’ve given it much of a chance yet. oh lady you MUST try the blushes and bronzers. Pure love in a pan. I keep hearing good things about Balance and Brighten, specifically that it covers ruddiness and is now available in a ‘fair’ colour way. I think I may need it in my life as a result. I have an Eye Stay duo from ages ago, and while I don’t use it often (the colours just aren’t “me,”) that stuff does. not. budge! I’d love to read what you think of the Balance & Brightens, though! I keep planning on buying some when it pops up as a TSV. Haven’t got round to it yet though. I looooooovvvvve Laura Geller makeup! I have the Blush N Brighten in golden apricot, which is heaven in a pan, and I have another blusher in Down to Earth, which is not really my colour but good quality, a shadow/liner in one which i literally wear every day, lipstick in tawny rose, and i’ve used the foundation, which i thought was lovely, the mascara which is quite nice and buildable, and I have the serious cover concealer. I have to say, since using her baked eyeliner, pencils just don’t come cose anymore, and her brushes are probably the best brand I’ve used, I prefer their quality to mac, they just don’t have the selection. Looking forward to an EOTD! Love it. I bought one from Cosmetic Candy’s blog sale. I csnt for the life of me remember what it is called but it is dark pink and sparkly grey and is my go-to shadow when I can’t be bothered faffing around with anything else. Balance-n-Brighten is a great product for a quick face. Her eye rimz brush works exceptionally well and is worth purchasing. I would love to see swatches! I fell in love with the Bewitching Bronze after swatching it at Sephora. I never saw the other colors so if you are able to post some swatches they would be most appreciated! How do you think these compare to MAC MSFs and MES? I’ve always wanted to try Laura Geller’s baked products since they look so similar. And I don’t have any LG face products, so can’t compare with my MSFs! I’m rubbish! Deal Alert: Hold it right there lady! Anyone for a Man Candle?